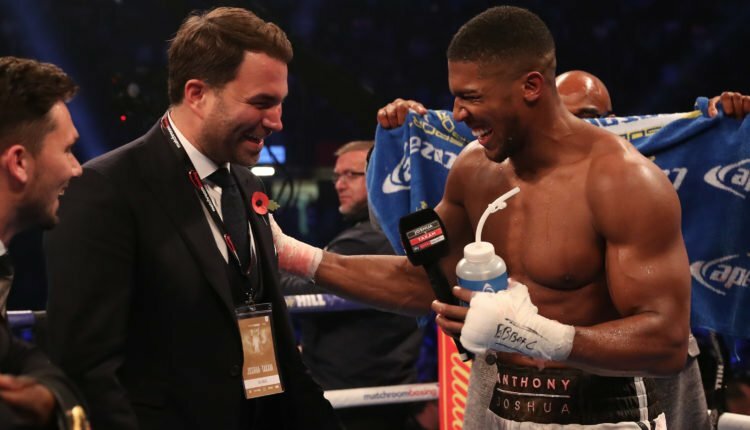 Even though the WBC has unanimously voted to sanction a rematch between Deontay Wilder and Tyson Fury, Anthony Joshua’s promoter, Eddie Hearn feels Joshua and Wilder is still in the cards for April. “No, I think the wording was everything in that one, sanctioned not ordered. I think what they’re saying is they would approve the rematch. Dominic Breazeale is the mandatory, who is supposed to fight the winner, so what they’re saying is that they would allow the rematch,” Hearn told Sky Sports. Hearn hopes that Wilder’s team will come to the table to sign for an April 13th unification fight at Wembley Stadium, but Wilder has made it clear that the only fight he wants is the Fury rematch. “The AJ-Wilder fight is a huge fight,” said Hearn. “AJ against Fury is a huge fight. AJ against Dillian Whyte is a big fight. Dillian Whyte is fighting Chisora on December 22, so we’ll see what happens in that one, and anything can happen.